For the half year ended 30 June 2016, Maybank Group's net operating income rose 8.7% year-on-year - reaching RM10.74 billion - as loans growth picked up pace, deposits surged strongly and the Group continued to benefit from its strong retail franchise in key markets. Growth came from all business sectors led by Group Global Banking at 17.5%, Community Financial Services at 9.7% and Insurance & Takaful at 1.2%. Net fund based income saw a 9.3% rise to RM7.60 billion, while net fee based income increased 7.4% to RM3.13 billion. Higher net income of S$400.62 million compared with S$398.12 million in the previous corresponding period. 21.6% rise in net fee based income which was boosted by a rise in treasury and Islamic banking earnings. Pre-provisioning operating profit rose 0.2% to S$221.82 million. 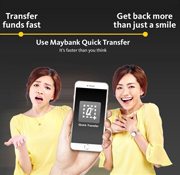 With Maybank "Quick Transfer"(QT) on your Maybank mobile banking app, you can swiftly transfer funds to another bank with just two taps. At your QT shortcut, simply enter your password and confirm. From now till end December 2016, start using this service and other online banking transactions to win cash prizes worth more than S$25,000. Senior management from Maybank and Samsung at the event launch, including (4th to 6th from left): Mr Mohd Suhail Amar Suresh Abdullah, Group Chief Technology Officer, Mr Michael Foong, Group Chief Strategy Officer and Datuk Lim Hong Tat, CEO, Maybank Singapore. You can now charge to your Maybank Credit or Debit Cards using Samsung Pay, at virtually all merchant outlets locally and overseas. 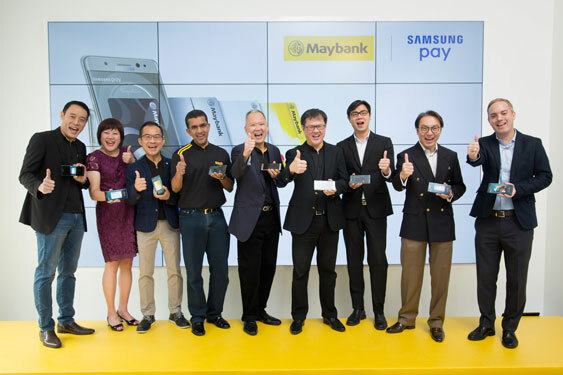 Singapore is the first market in ASEAN where Maybank has rolled out Samsung Pay. Enjoy greater peace of mind and convenience, and reap greater benefits from being able to rely on your digital wallets to pay on the go. Look out for more details on our special promotions, including attractive cash rebates, lucky draw and 1-for-1 promotions! Visit maybank.sg/spay to find out more! Experience the convenience of Business Internet Banking (BIB) on your iPhone or at a glance of your wrist on your Apple Watch. With a touch of your screen, you can easily access and track your account balances via Quick Balance, which is the most commonly used service in BIB by customers. Managing your finance while on the go is now a breeze. Find out more about BIB Lite here. 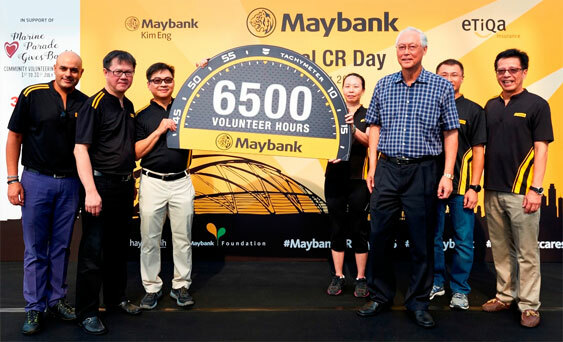 On 20 August 2016, Emeritus Senior Minister Goh Chok Tong joined our CEO Datuk Lim Hong Tat to unveil a total of 6,500 volunteer hours which we have contributed to the community, in line with our 7th Global Corporate Responsibility Day. The focus of our initiatives was to improve the living conditions for four target groups - lonely seniors, vulnerable families, people with intellectual disabilities and mental health patients. 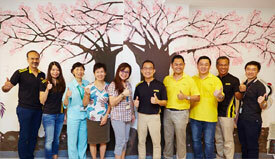 Working with our beneficiary partners, more than 1,200 Maybank employees in Singapore carried out various initiatives ranging from home refurbishment for vulnerable seniors and families to painting wall murals to brighten up the environment for mental health patients and special school students with intellectual disabilities. We also supported the 'Marine Parade Gives Back!' community volunteering month initiative, to match community volunteering hours with $12,000 worth of grocery for beneficiary families staying in Marine Parade. ESM Goh Chok Tong joined our CEO Datuk Lim and senior management to unveil the 6,500 volunteer hours we achieved. We also supported WeCare@MarineParade's volunteering month and encouraged residents to give back to the community. Bank staff helped to refurbish and provide basic household items to 50 vulnerable seniors and families identified by Lions Befrienders and Montford Care. We painted wall murals in IMH and MINDS Fernvale Gardens School for mental health patients and special needs students. Maybank Premier Wealth organised a special event on 24 July to bring our Premier Wealth clients together for a good cause! 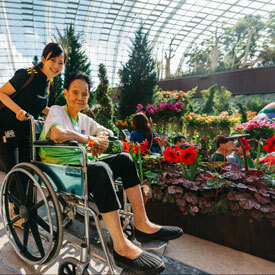 Around 50 clients teamed up with our Relationship Managers as volunteers to bring seniors from Lions Befrienders to visit the Singapore Garden Festival, which is one of the Top 3 Garden Shows in the world. The seniors were delighted by the beautiful floral displays, and also had fun creating their own garden terrariums. Mr Choong Wai Hong, Head of Community Financial Services, commented, "Some of the clients came up to me, genuinely impressed and appreciative, as it was the first time they dealt with the seniors. 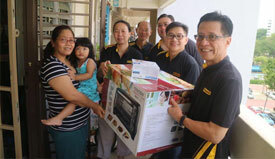 They found it different from all the other events they have attended, as Maybank, our customers and Lions Befrienders worked together to serve the community." Enjoying the beautiful blooms at the Singapore Garden Festival. 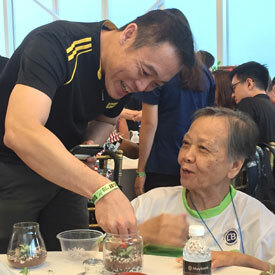 Mr Choong Wai Hong, Head of Community Financial Services helps a senior with her garden terrarium. How can you invest to potentially amplify your wealth so you can better fulfil your life goals? If you do not have a substantial amount of capital and time set aside for financial investing, one of the avenues you can consider is to take up a Monthly Investment Plan or what's also known as a Regular Savings Plan.